Fantastic new EP from celebrated British band The Popguns! Lead track ‘Still Waiting For The Winter’ is one of the highlights from the band’s critically acclaimed ‘Pop Fiction’ album. A stunning showcase of dual female vocals, jangling guitars, and melodies galore, the song is a reflective journey of nights out on the Brighton seafront and the conflict between yearning for the past and living for today. The EP also features three exclusive new tracks that spotlight the incomparable Popguns vocals with stripped back arrangements. ‘BN3’ is a gorgeous slow time waltz with carefully strummed acoustic guitars and lead vocalist Wendy Pickles telling the story of a sporting romance played out at Hove County Cricket Ground. ‘Why You Fell In Love With Me’ is sung with a heartfelt lilt by Kate Mander and has a relaxed country feel and ace harmonies. Finally, ‘Diane’s Song’ continues the Chet Baker theme started on ‘Pop Fiction’ album track ‘Alfa Romeo’ with an absolutely glorious tune that would make Bacharach and David proud. 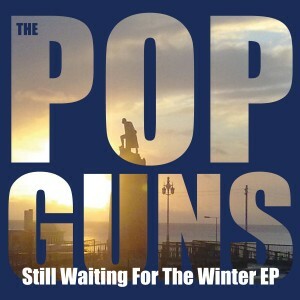 Limited to 1000 copies in custom minijacket sleeve, ‘Still Waiting For The Winter’ is a melancholy diversion for The Popguns as they begin recording a new album.